The North Dakota Legislature approved, and Gov. Doug Burgum signed, legislation last May authorizing the use of water from the Little Missouri State Scenic River for fracking oil wells. Now our state engineer, Garland Erbele, has issued industrial water permits authorizing more than 2.1 billion (that’s 2,142,000,000) gallons of water to be taken from the river. So far. The withdrawals are actually measured in acre feet, and the allocation by the state engineer, who works for the State Water Commission, is about 6,600 acre feet between now and next Oct. 30. An acre foot is enough water to cover one acre of land a foot deep in water. That takes about 325,000 gallons. I don’t know if the permittees will get as much as they’re authorized, but they could, if the technology is there, and the river cooperates. I also don’t know how much water there is in the river, but I do know the river has been running pretty close to dry all summer and fall. It’s a big number, but I am not really concerned about that. As the oil boys will tell you, if we don’t take it out, it just goes to New Orleans, and they have plenty of water. There are plenty of other things I am concerned about, though. Like the impact of all this industrial activity on the integrity of the Little Missouri Scenic River Valley, North Dakota’s only State Scenic River. And conflicts of interest. For example, the newly elected chairman of the Little Missouri Scenic River Commission, Joe Schettler of Killdeer, is a partner in a company called Streamline Water Services, and his company, which sells water to oil companies for fracking, has industrial water permits to draw 715 acre feet between now and next August. And Scott Kleeman, Schettler’s proxy on the Commission if Joe can’t make it to the meetings, is part of a family operation that has an industrial water permit to draw 900 acre feet and sell it to oil companies between now and next April. There’s also one more potential conflict. At last week’s meeting, neither the McKenzie County Commission member David Lee Crighton, nor his proxy, Kit James (who also has an industrial water business), was able to attend, so they sent Kaye Nelson to represent the county. Kaye is the widow of Alvin Nelson, the former commission chairman back when it used to have meetings, around the turn of the century. Apparently she attended a lot of the meetings with Alvin, so the county felt like she could represent them well. 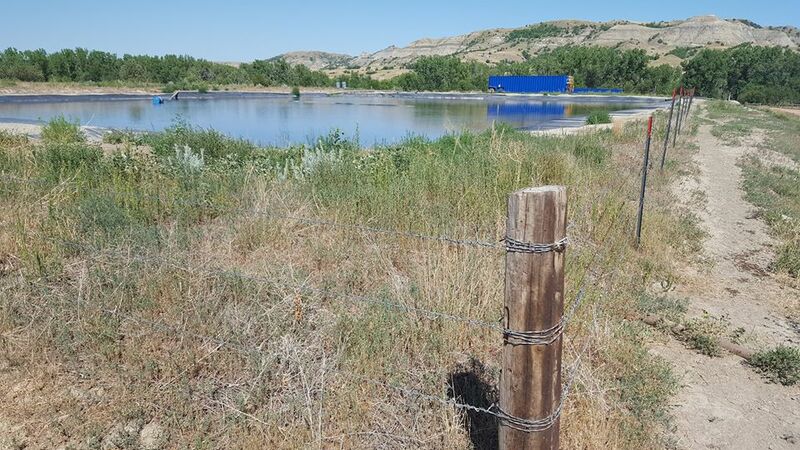 The problem is, a company called Select Energy Services has a water depot on her ranch along the Little Missouri west of Grassy Butte, and it has an industrial water permit to take about 100 acre feet of water between now and next May. To be fair, all of them have been in the water business a long time, and were in it when they took their seats on the commission. I’m guessing the county commissioners in their counties who appointed them knew about that. But they’ve not taken advantage of their positions on the Scenic River Commission for personal gain. So far. Still, it would seem like there’s a pretty big potential conflict of interest there. One of the other commissioners told me this week that the fact they are in the water business threatens the integrity of the whole commission. Right now, the industrial permits are being given out by the state engineer under an “interim” policy allowing river water to be used for fracking. “Interim” because Gov. Burgum wants the approval of the Scenic River Commission before he makes it permanent. At last Wednesday’s commission meeting (I wrote about it earlier this week), there was a motion to approve Burgum’s “interim” policy. It was made by Gene Allen of Golden Valley County. But no one seconded the motion, so it died. And they voted to postpone consideration of the policy until their next meeting. Schettler was chairing the meeting, so he couldn’t second it. Nelson also demurred. Maybe she thought it would be inappropriate because she has a potential conflict. Or maybe it was because she really isn’t a member of the commission, and was just filling in. In any case, it would be good if the members who are already in the industrial water business made that fact known to the rest of the commission and to the public. Well, I guess I just did that for them. If there are any other members who are in the water business, or have a potential conflict, I don’t know about it. If so, they should ‘fess up as well. The rest of the list of industrial water users who have gotten permits since the governor signed the bill May 2 is pretty interesting, too. Erbele didn’t waste any time. On May 5, just three days after the bill became law, he signed the Kleeman family’s permit for 900 acre feet. The second one was even more interesting. On the 9th, he granted a fellow named Wylie Bice 700 acre feet. You might remember that name. I wrote about him last summer. He’s the guy who sold his trucking company for $80 million or so, bought the ranch next door on the other side of the Little Missouri Scenic River and then built a bridge over the river to get to it. One side of his bridge is on federal land, owned by the Bureau of Land Management, as is a road he built on federal land to access it. And then he put in an illegal water depot on BLM land beside the Little Missouri River, a big plastic-lined pit to store the water he’s taking from the river to sell to oil companies. Wylie Bice’s illegal water depot, on BLM land. The BLM has been up to see Bice, and it’s given him an application to apply for a bridge and a road, to “get things legal.” I don’t know about the water depot. I’m having a hard time wrapping my head around the idea that the BLM might give him a permit for a bridge and a road after he’s already built them. I’m going to go out to Dickinson to the BLM office one of these days and take a look at that application. What I’m not going to get a look at, my friends at the BLM tell me, is what is called a “trespass file.” I’m not sure exactly what’s in there because it’s confidential right now, but I have to guess they’re considering some kind of legal action against Bice for putting stuff on federal land without permission. I’ll find out more about that when I get to Dickinson, too. Also troubling is the creep of fracking further south into the Little Missouri River Valley. A company called NP Resources is drilling two wells near the Little Missouri Scenic River between Medora and the Elkhorn Ranch. The wells are on land owned by two pretty wealthy friends of mine who have purchased ranches along the river to protect them from development. One is directly across the river from the Elkhorn, President Theodore Roosevelt’s historic home. In both cases, the minerals under their ranches are owned by someone else, so they were powerless to stop them. Mineral owners trump surface owners. In both cases, NP resources applied for and was granted water permits for 58 acre feet of water from the Scenic River — bout half a million gallons each — to frack the wells. It’s troubling because the industry appears to now be making serious advances deep into the heart of the Bad Lands, in the Little Missouri Scenic River valley, not so far north of Medora and Theodore Roosevelt National Park. The rest of the permits are mostly for a couple of hundred acre feet, and ranchers are taking advantage of their location beside the river to make a little money. Maybe more than a little. Hard to begrudge them that. Let’s make sure we do that. It’s getting harder, though.